After TNT’s last album of melodic hard rock excellence, My Religion, I was eager to get my first listens to the band’s latest effort. Finally, here it is. All the Way to the Sun is TNT’s latest effort. Vocalist Tony Harnell has already made some noise in the scene earlier this year with his other band, Starbreaker, and their fantastic debut album. Personally, the Starbreaker debut album will surely be near the top of my “Best of 2005” list when it is all said and done. Will Tony and the rest of TNT deliver another album that soars up the same list for 2005? Not quite. Perhaps I’m left spoiled with the consistency of My Religion and the hard hitting, bombastic Starbreaker album. All the Way to Sun has a few tracks that grab my attention, a few that are somewhat enjoyable, and yet a couple more that present no holding value at all for me. The album starts off quite nicely, but after several listens, I’m finding it very difficult to stick with the album start to finish. A Fix gets things started. I am very much reminded of Realized Fantasies era TNT with this song; double kick drums and Tony’s voice soaring to the higher octaves. The chorus lines are simple, yet melodic and memorable. Too Late and Driving follow, delivering a couple of addictive mid tempo tracks that are a logical continuation of My Religion. Ronnie LeTekro delivers some classy solos during these tracks, which combine with the poppy, melodic quality of the tunes to make them standouts of the disc. Me and I sees the band head in a bit of a different direction. The tone is bit more dark, yet the chorus line is huge, with Tony again soaring for the high notes with great emotion. Tempo wise, the track is very restrained, yet the guitars have a dark and hard edge to them, which actually works out pretty well. From this point onward, my level of interest starts to drops off. Sometimes is next, and is the lead single off this album. It is very poppy, largely acoustic track. A nice melody and chorus line can be found here, but the track just lacks energy. Again, Tony sings his heart out here, but the track as a whole just doesn’t have a huge impact on me. The first half of the album is rounded out by the title track, and the band takes a different path yet again. This time, they tune down the guitars and offer a modern sounding track, much like what you’d hear in the American modern rock scene. This is a plodding, groove based track, with Ronnie laying down some nice solos throughout the song. Tony wails like only he can, but the down tuned guitars don’t complement his voice very well. Tony’s stellar vocal performance and a nice chorus are shining moments for the song, but again, that’s just not enough to keep me playing it repeatedly. That concludes the first half of the disc. One common thread you might notice in my comments is that of Tony Harnell’s performance on this album. Between this album and the Starbreaker debut, Tony has outdone himself this year. 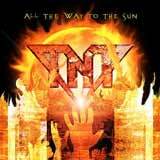 While I’m not crazy about all the songs on this new TNT album, I cannot deny that Tony Harnell has put forth one hell of a performance on this album. Moving along with the CD, the second half gets going with an odd choice; a cover of Louis Armstrong’s What a Wonderful Life. This choice is really odd in comparison to the rest of the music on this album; it really sticks out like a sore thumb. However, TNT are covering a lot of ground on this album (acoustic pop to hard rock to modern rock, etc…), so such a strange diversion as this doesn’t totally surprise me. Tony’s excellent performance (again) makes this track worth a listen though. The Letter comes next, and sees the band return to a style much like Too Late and Driving, but it is sorely missing a catchy and memorable chorus line, unlike the aforementioned. Mastic Pines follows up, and is nothing but an unnecessary and uneventful instrumental track. Black Butterfly is next, and finally sees the band ratchet up the tempo. This track is hard hitting, with a forceful and aggressive riff patterns, but lacks a memorable melody or chorus line. Still, Ronnie’s guitar work salvages the track, making it a decent listen. This leads into the next track, a more lofty and mid tempo track, Save Your Love. Tony shows some forceful vocals here, but as with most of the songs on the second half of the disc, the song just isn’t very memorable. It’s a fun little rocker, but it just doesn’t offer the memorable qualities that I have come to expect from TNT. The album closes on a strong note, Ready to Fly. The sound is a bit more contemporary, albeit not as obvious as the down tuned title track. Finally, the guys give us a memorable chorus line to chew on. Combined with the two constants of this album, phenomenal vocals by Harnell and the guitar magic of Ronnie LeTekro, this track is a winner in my book. Although this is a decent TNT album with it’s share of highlights, I am moderately disappointed with part of the album as well. I really thought the band hit its stride with the ever consistent (and excellent) My Religion. All the Way to the Sun seems to try a little too hard to cover a lot of musical ground here; some good, some not so good. I can commend the band for not wanting to become stale or repetitive, but it just sounds to me like they’re trying to do too much on this album. Still, as with any TNT album, there are plenty of highlights here; namely Tony Harnell and Ronnie LeTekro. However, don’t go into this album expecting them to beat, or even match their last effort.